Simple. Fast. Just plug in a pair of Traxxas iD batteries and press Start. Traxxas' exclusive iD technology eliminates complicated charger programming by automatically configuring and optimizing the charge settings for Traxxas iD batteries. The EZ-Peak Dual charges two batteries simultaneously at up to 50 watts (4 amps)each, or switch to High-Output mode to charge a single battery at the maximum 100 watt (8 amp) output. Charging faster means more fun time behind the wheel. 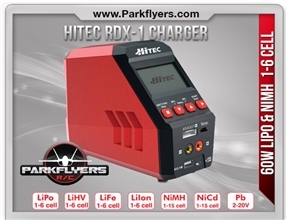 You can even charge a NiMH and a LiPo at the same time! The progress bar and audible alerts keep you informed while the advanced high resolution peak detection delivers a perfect charge every time. The EZ-Peak Dual's Storage Mode protects your LiPo battery investment by safely preparing the batteries for extended storage. Faster charging means you get to spend more time behind the wheel. The EZ-Peak Dual puts out a full 100 watts of power that equates to 8-amps of charging horsepower. It's a twin turbo-equipped charger. Traxxas iD LiPos (4000mAh or higher) charge nearly 2x faster in High Output Mode. The EZ-Peak Dual isn't just for iD LiPos; the Multi-Chemistry nature of the charger means LiPos and NiMHs can be charged at the same time. Advanced Mode opens the door for backwards compatibility. 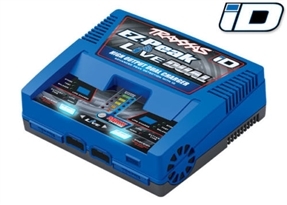 This allows EZ-Peak Dual to charge any Traxxas Power Cell battery equipped with a first-generation Traxxas High-Current Connectors and Traxxas iD batteries independently or simultaneously. 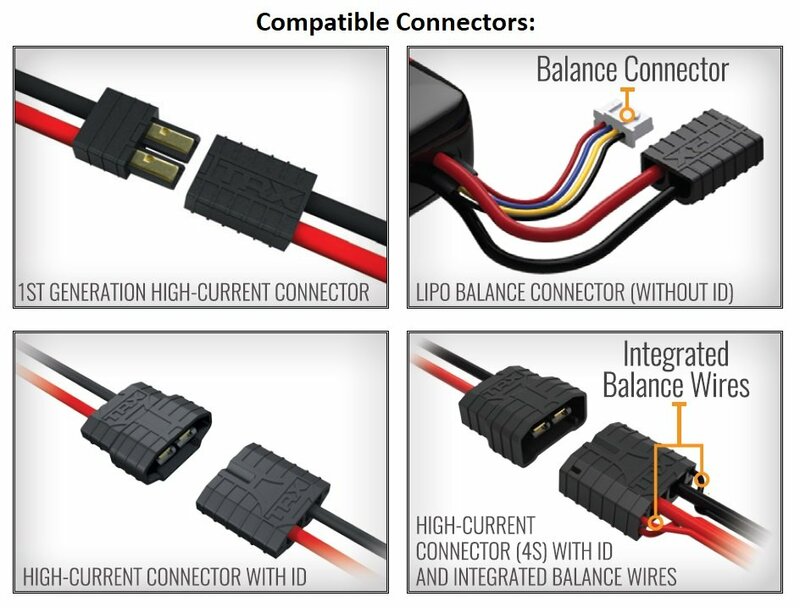 There are two balance ports built into the charger for Traxxas LiPo batteries equipped with external balance leads. Take full advantage of the 8-amp output and experience the pinnacle of charger flexibility and power. With iD Auto-Battery Identification there's no need to worry about the battery chemistry or capacity. EZ-Peak Dual identifies the type of battery and its capacity. EZ-Peak Dual also cuts down on wasted time by eliminating the hassle of programming and using complicated setups. Just plug an iD battery in and press Start. That's it! Keeping with the simplicity and ease of use, the iD system eliminates fragile balance wires and clunky balance leads. The iD system streamlines the entire charging experience. Please note: Traxxas iD equipped batteries and chargers are backwards-compatible with previous generation Traxxas connectors. Please see the full lineup of Traxxas charge adapters for the proper adapter for your particular application.